Lines are the building blocks of drawings. Ink drawings are so lovely in themselves that many just stop with a line drawing. I really enjoy taking ink a bit further to make a value drawing. In case that’s a new term, a value drawing is one that focuses on the values, or the light to dark ranges, within a subject. There are many ways to create value with ink. I’m known for my vertical lines. I create dark, or low,values with lines that are very close together. The light, or high, values happen when the lines are far apart. But any kind of ink line will do – squiggles, cross hatch, wavy lines, even dots or stippling. I recommend practicing with your pen to try different kinds of lines and find out what looks best to you. Then, try making a value scale to practice getting a good range from dark to light. Here’s a value scale I did with different kinds of lines. And here’s a still life I did using squiggles instead of straight lines. 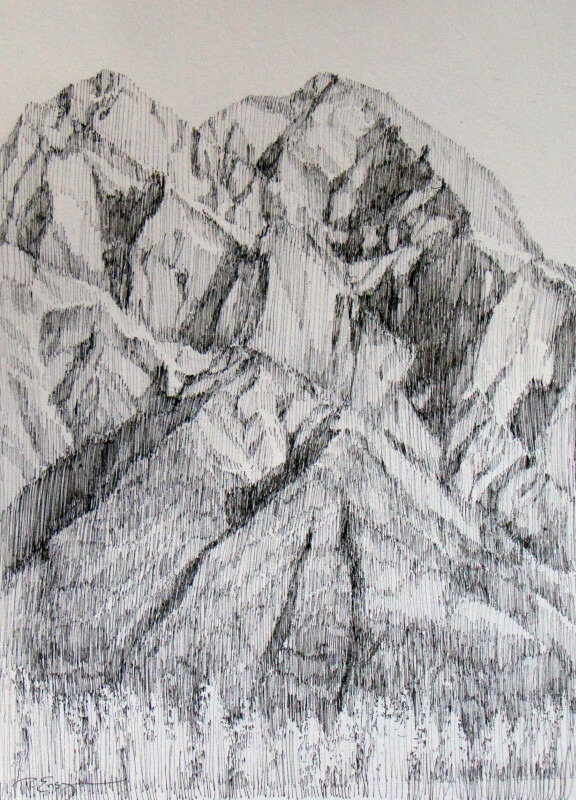 The drawing of Pyramid Mountain above shows how the proximity of the lines creates depth within the mountain ridges. Here’s another drawing I just finished today of a meadow and forest. I’m always fascinated to see how just a bit of the darker values adds form and shape. I’ve come to enjoy these black and white value sketches so much I rarely add color any more to my sketch book. i just love getting your e-mail. Thank-you. I look forward to receiving them.